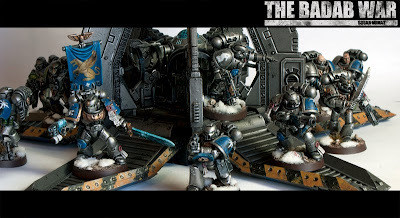 We all love our armies and often form lasting connections with some of our models. Why not give them a more lasting place in our hearts and the grim, dark world they hail from? I used to just paint the main chunk of my army to get it done and be "there" for my games. 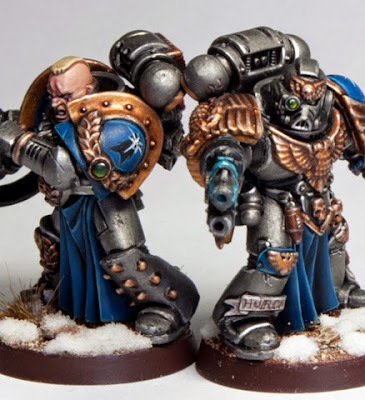 The only models I held dearly were maybe some of my characters or a lowly Tactical Marine who somehow manages to take out a Land Raider in almost every game. I would rush through painting the meat and potatoes of my army to get to the good stuff and lavish all my time and thought on them. Often just gluing my models together in the most basic (read: boring) pose possible because it was the quickest. Then came the great wargaming internet boom of the 2000's and I got to start seeing how other hobbyists out there really lavished as much time and detail on every model of their force. Not just with painting either, but with establishing a back story, a name and lore that gave tactical marine 37 some more substance and depth. 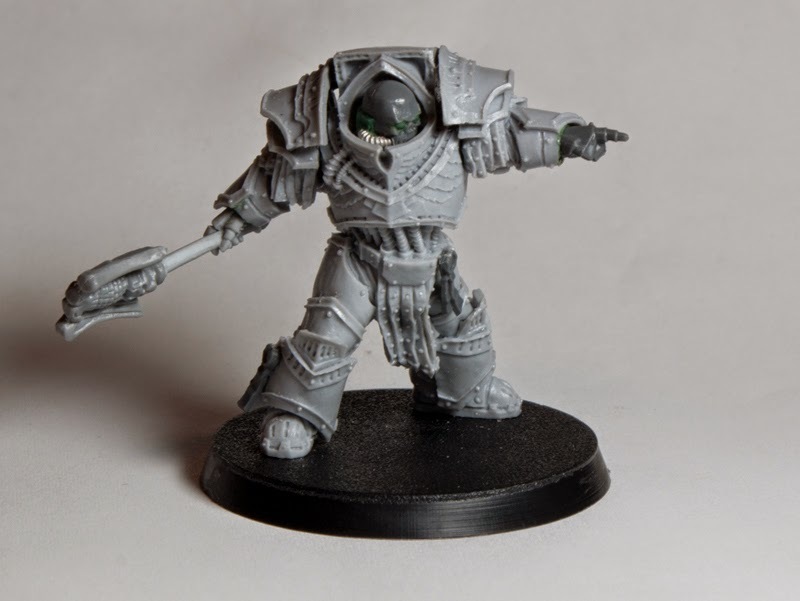 This is easiest to do with a small elite army, such as Space Marines, since you generally have less infantry models. When I started my newest Marine army, my Astral Claws, I was determined to give it a shot. In the lore Space Marines are described as being larger then life heroes, even the average line trooper and I wanted to reflect that with my army. You can do this several ways. You can establish a story before you even start to build your model and use your story cues to influence your design choices. You can finish your model entirely and then write your story based off of his finished appearance or you can do a little of both as you go along. This is generally what I do. I start with a basic idea: This guy is a little unhinged, or this guy is quiet and brooding, and use this to influence my design. I then flesh out the rest of the story at the end. 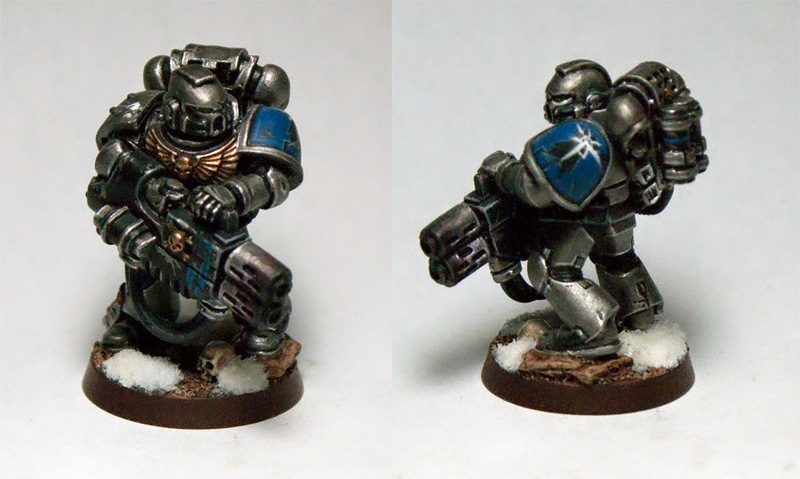 I also did quite a bit of research into the Astral Claws overall character before I started which gave me the little nugget of information that they are supposed to be somewhat influenced from early Babylonian design. Hence all of my names come from a Babylonian name data base. Balathu was recruited from Badab Primis itself. In his youth he had joined a local hive gang to survive and became a ruthless murderer. When the Astral Claws went throughout the hives to recruit, one of their number was attacked by Balathu, who saw it as a chance to prove his worth and either join the astartes or elevate his position within the gang. He was defeated, but not without nearly slitting the marine's throat. Normally this type of attitude would not be tolerated within the astartes, but with Huron's drive to expand his chapter to the strength of a full legion Balathu was given a shot, he clearly had the martial talent. 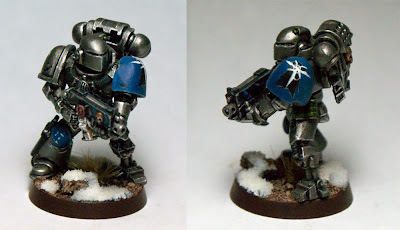 Once within the ranks of the Astral Claws his brutal attitude made him a perfect fit for the Retaliator squads that were being formed. He served amongst their number for a decade before a lucky greenskin managed to take his left leg. The bionic replacement slowed him down to much to keep up with his brother retaliators and he was re designated as a Tactical marine. While he was a more then competent warrior he did not get along well with others and mostly kept to himself. He connected most with Sin-Nasir and Rihat and to everyone's surprise Arshaka. His friendship with Arshaka was merely a means to an end however. He knew that Numas was wary of him and did not fully believe in Huron's plans so he used Arshaka to keep tabs on the Sargent. Before a boarding action against the Red Scorpions Arshaka confided in him how Numas planned on switching over to the "loyalist" side if things became to dire, unfortunately Arshaka, Numas' only true ally, never made it off the enemy ship. Underneath the Palace of Thorns it was Balathu who slit Numas' throat and led the remnants of 2nd squad back to safety. The one item that Balathu always kept with him since his youth as a ganger was his combat knife, which was refitted with a mono-molecular edge after becoming an Astartes. Balathu's fluff came from his menacing helmet, his bionic leg, and most of all his unique combat knife. Again much of my fluff was influenced from the model. I said he was tall because due to the way I posed his legs he did end up being about a head taller then an average marine and something about his pose just struck me as the silent type. Its also worth noting that at this time he was the 5th or so marine to get a back story so his story was influenced from those before. It helped me evolve a mythology for this squad that interconnected. I really find this type of storytelling enhances my modeling projects because I care so much more about the end result. 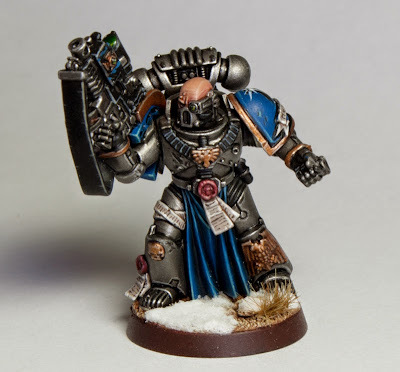 Its exciting for me because much of my story for this army is not planned out and just kind of evolves in the moment, so I don't even know where the next one will go. The last two from Monday had their stories developed as I was writing them. I have already started thinking about how Squad Illinos' story will progress. Do I want them to be as twisted as Squad Numas, or will they be more down the middle? I really enjoy bringing a little more life to my models since I spend so much time modeling and painting them. I even do this with my Tomb Kings, but only for my characters so far. Have you done this for any of your models?